"A friend once told me that the wealthy elite didn't want to just 'roll back' the New Deal, they wanted to roll back the entire 20th Century. His point was that all the social gains of the 20th Century were granted to us in order to combat global communism, and that with the collapse of communism the wealthy elite are going it take it all back. "I didn't fully appreciate his sentiments until recently. "The recent upsurge in global piracy seems strange and exotic in today's world, but in fact it is rather appropriate in the full context of national events. "Below is a list of trends which show the 21st Century is going to look a lot more like the 19th Century than the 20th Century. "Can we finally stop saying "Big Labor"? Last year labor union membership had shrunk to 11.8% of the total workforce and only 6.6% of the private sector. "You have to go all the way back to 1900 to find such a small union footprint in the private sector. "Along with the destruction of labor unions and the middle class we've see a dramatic rise in inequality. The U.S. has the worst inequality in the developed world. "Inequality has hit levels not seen since the Robber Barons. 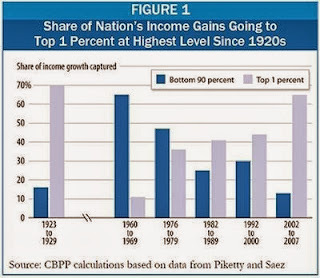 "In fact, inequality has reached levels not seen since the 18th Century. "American income inequality may be more severe today than it was way back in 1774 — even if you factor in slavery. "50 years ago people were horrified that the mentally ill were being "warehoused" in mental institutions. So the government turned the mentally ill out to live in the street. Now we have come full circle and the mentally ill are being warehoused again, but this time in dangerous prisons. "The most vulnerable in our society have been completely abandoned by our society. "It appears that the lessons in humanity that people learned 150 years ago have been forgotten. "The country's three biggest jail systems—Cook County, in Illinois; Los Angeles County; and New York City—are on the front lines. With more than 11,000 prisoners under treatment on any given day, they represent by far the largest mental-health treatment facilities in the country. 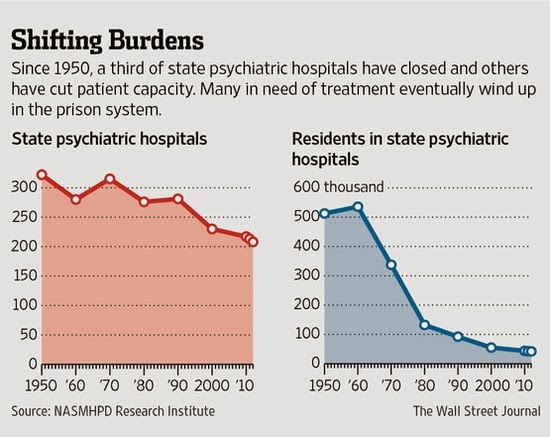 By comparison, the three largest state-run mental hospitals have a combined 4,000 beds. 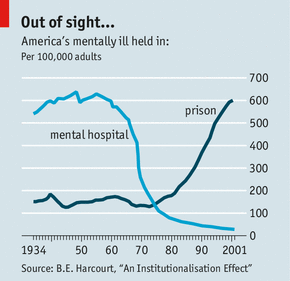 "Two centuries ago, reformers were disturbed to find large numbers of the mentally ill in jails, paving the way for the development of state-run institutions. 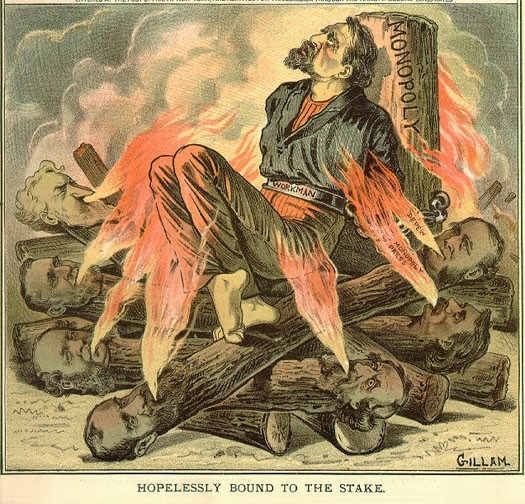 "With the end of the Civil War, employers all over the south were confronted by the reality of the end of free labor. They appealed to their state representatives for help and their representatives responded by finding a pool of free labor previously untapped - prisoners. "It was called Convict Leasing. The prisoners would work for companies during the day outside of prison, and then return to their cells at night. Neglect, brutality, and abuse of the prisoners were rampant, as was official corruption. The conditions were so harsh that prisoners rarely survived longer than 10 years, but everyone was making money from it (except for the prisoners, of course) so the system remained. "In fact the system was so successful that there was a need for more labor. In many states simple assault carried sentences of seven and eight years of hard labor. Larceny could get you twenty years in prison. "Stealing five dollars worth of goods could net you twelve months. Even the theft of a rail fence could put you in prison stripes. "Of course, this reality wasn't true for everyone (read: white people). If it was then there would be a political backlash. Instead these inhumane laws fell disproportionately on the recently freed black community. "At Tennessee's main prison in Nashville, African-Americans represented 33 percent of the prisoners in October of 1865. In 1866 Tennessee passed it's convict leasing law. By 1869, 64% of the prison was African-American, and it kept climbing in the following years. 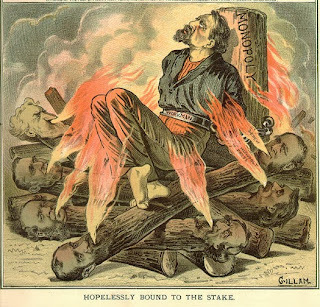 "This abuse of prisoners by so-called capitalists ended in the early 20th Century only because of the efforts of the labor movement, sometimes with violence. "The decline of labor unions has witnessed the return of the private prison industry and once again african-Americans are the primary victims. "America's prison industry is completely out of control. "Although the US is widely recognized as a 'land of liberty', it could also be described as a nation of prisons. 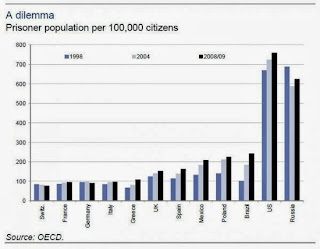 It incarcerates more people per capita than any other nation. 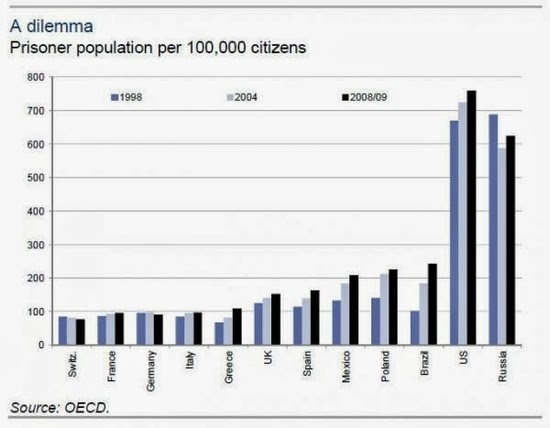 Its imprisonment rate (per capita) is almost 50 percent higher than Russia's and 320 percent higher than China's. "Mass incarceration is not a result of higher crime rates: The US has the highest incarceration rate in the world not because it has higher crime rates, but because it imprisons more types of criminal offenders, including non-violent and drug offenders, and keeps them in prison longer. "Mass incarceration has had a devastating effect on blacks and Hispanics in the US. African Americans are six times more likely to be incarcerated than a white person and non-white Latinos are almost three times more likely to be incarcerated, according to the Pew Center on the States. "Incarceration hits hardest at young black and Latino men without high school education. An astounding 11 percent of black men, aged between 20 and 34, are behind bars. "Imprisoning people is not cheap. The average cost of housing an inmate is approximately $20,000 to $30,000 per year. This price tag comes at the direct expense of public money that could be spent on public education, medical care and public assistance. And it is one reason why so many states face fiscal crises today. "To put this in perspective, the state of California spends 2.5 times more money housing and feeding its inmates than it does educating students. California is not alone: five states 'spend more on corrections than higher education', a 2008 Pew Center study revealed. "The current unemployment rate in the US is high. And if we factored in all the people who are not looking for work because they are behind bars, it would be higher - especially among young black Americans and people without a high school diploma. "That's a lot of people in prisons, and a lot of taxpayer money being spent on keeping people in prisons. Much of this has to do with media-inspired fear and general racism. But there is also another element involved: profit. "Their report explains how private prison companies insist that states embed 'occupancy guarantees' into their contracts with the public sector. 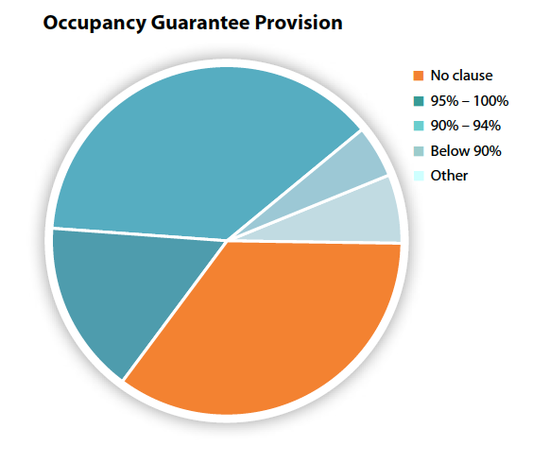 They estimate that at least 65% of all private prison contracts have such guarantees, and in some states, like Arizona, the guarantee is a shockingly high 100%. This leads to overcrowding in many instances, and sometimes violent offenders are placed in prisons set up for nonviolent offenses just to fill the quotas. 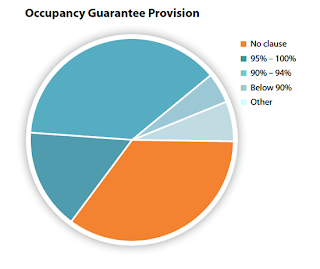 In the event that the beds can’t be filled, the taxpayer makes up the difference to the private prison company. "There are 220,000 people in private prisons right now (around 1 in 10 prisoners), and the states have quotas to meet to make sure that they stay full. 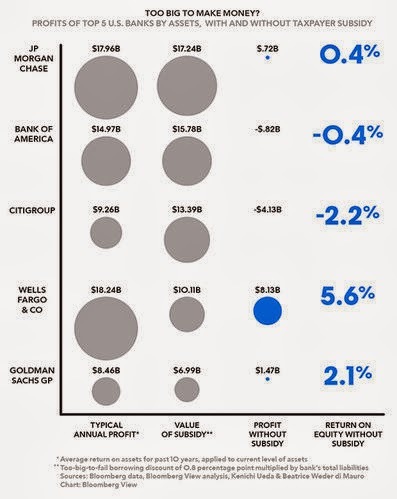 In 2010, two prison corporations made $3 Billion in profit. "This is wrong on so many levels that I can't even count them all, but one of those levels is conflict of interests. "Then it became known that two of the judges were taking bribes from the owners of two private prisons for prescribing the harshest sentences for convicted juvenile offenders to ensure that these two prisons were kept pretty much full of gratuitous labor. The total amount of bribes was $ 2.6 million. Much like the 19th Century convict leasing system, corporations are taking advantage of this pool of slave labor. "Today, the U.S. prison industry produces 100% of all military helmets, uniforms, belts and shoulder belts, vests, ID cards, shirts, pants, tents, backpacks and flasks for the country`s army. In addition to military equipment and uniforms, prisons produce 98% of the market in installation tools, 46% of bulletproof vests, 36% of home appliances, 30% of headphones, microphones, megaphones, and 21% of office furniture, aircraft and medical equipment, and many more. "In the Vicky Pelaez article we read: The prison industry is one of the fastest growing industries, and its investors are on Wall Street. In fact, many prisons are self-financing. Thus there is no economic pressure to close them down. "What's more, with so many corporations making so much money off of prison/slave labor, it becomes corporate interests to keep as many people in prison as possible. As the security/prison complex becomes larger and more wealthy, it will become increasingly difficult to reform the system. "One last note: since America's experiment with private prisons returned in 1984, other nations around the world have begun adopting the system, including the UK, Israel, Brazil, Sweden, Australia, and Estonia. Other nations are also considering it. "The Supreme Court has made it clear in three different rulings that debtor prisons are unconstitutional. You can't throw someone in prison for not being able to pay a fine because that would mean treating the rich and the poor differently under the law. "Yet state and local courts routinely ignore this constitutional right. "Yet judges routinely jail people to make them pay fines even when they have no money to pay. As Ethan Bronner reported last week in The Times, minor offenders who cannot pay a fine or fee often find themselves in jail cells. "And felony offenders who have completed their prison sentences are often sent back to jail when they cannot pay fees and fines they owe because they could not earn money while locked up. "The federal government and many states abolished debtor prisons in the 1830's, but more than a third of U.S. states allow courts to throw poor people in jail for failure to pay even minor fines. These 15 states also have the highest incarcerations rates. "Since the start of the current economic depression, with more people struggling than ever, the states have gotten increasingly intolerant towards debtors. "Some states also apply 'poverty penalties,' including late fees, payment plan fees, and interest when people are unable to pay all their debts at once, according to a report by the New York University's Brennan Center for Justice. Alabama charges a 30 percent collection fee, for instance, while Florida allows private debt collectors to add a 40 percent surcharge on the original debt. Some Florida counties also use so-called collection courts, where debtors can be jailed but have no right to a public defender. "Whooping cough, mumps, rubella, polio, TB. These are just some of the diseases that were once nearly eradicated from the United States. That effort was conducted, not by the private sector, but by a huge public health effort. "Now those efforts are in danger of being undermined. "Massachusetts is seeing a surge in the number of unvaccinated children. Last year, nearly 1,200 kids entered kindergarten with religious or philosophical vaccine exemptions, roughly double the total about a decade ago. "The combination of the religious-right's War on Science with the gradual gutting of public spending on health is exposing the nation to a return of the diseases of yester-year. "Around the world in 2003 there were 530,000 deaths from measles, mostly in children. "1963: A measles vaccine promises to contain a disease that infected as many as 4 million Americans each year and killed 400-500. "2000: A panel of experts declares measles eliminated in this country. 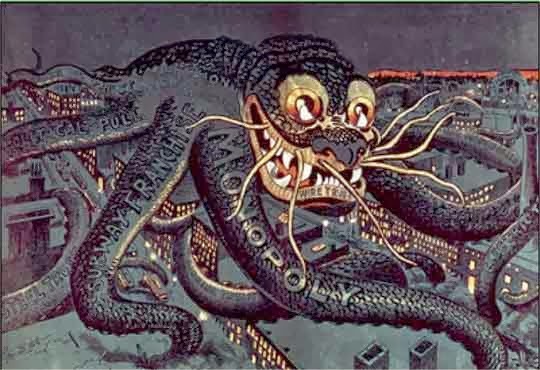 "Monopolies aren't just a danger to the economy, they are a danger to our democracy. The Progressive Era public understood this more than 100 years ago. Why have we forgotten this today? "Back then the public forced the government to act to break up to Too-Big-To-Fail corporations that harmed the public and business competition. Today there is no outcry for anti-trust enforcement, yet we wonder why our labor unions have been crushed, the cost of living keeps going up, and the economy stagnates. "Anti-trust laws date all the way back to Edward III in 14th Century England. "Adam Smith was particularly hostile to monopolies. "Like all monopolies, the monopoly of colonial trade imposes costs throughout the rest of the economy and reduces the competitiveness of the rest of the economy. "Pretty much every economist since Adam Smith, from David Ricardo to John Maynard Keynes, supported anti-monopoly laws. That is until Milton Friedman and Alan Greenspan came along in the 1980's. We are now witnessing the results of Friedman/Greenspan's faith in free-market fundamentalism. "It's really quite simple, and only the most extreme right-wingers still deny that monopolies happen and they are bad for the economy and democracy. "There is no reasonable person denying that corporate America is increasingly concentrated. "For example, recall in the 1980's that a telecommunications monopoly was a bad thing, and now look at AT&T today. "Most of Standard Oil has been reconstituted. "Monsanto has monopolized seed production. "So why don't we read about this financial monopoly in the press? Well, that's another story. "Of the 1,500 daily newspapers in the country, 99 percent are the only daily in their cities. Of the 11,800 cable systems, all but a handful are monopolies in their cities. Of the 11,000 commercial radio stations, six or eight formats (all-talk, all-news, variations of rock music, rap, adult contemporary, etc. ), with an all but uniform content within each format, dominate programming in every city. The four commercial television networks and their local affiliates carry programs of essentially the same type, with only the meagerly financed public stations offering a genuine alternative. Thus, most of the media meet the tongue-twisting argot of Wall Street in J being oligopolies that are collections of local monopolies. 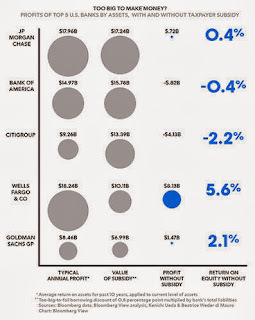 "No place has a more concentrated monopoly than Wall Street. Nor one more dependent on the taxpayer. 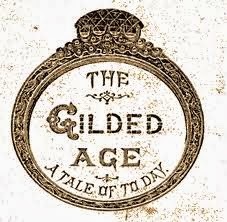 "Politics of the Gilded Age had several distinct qualities: 1) blatant corruption, 2) excessive influence by corporations, and 3) neither political party distinguishing themselves from the other, especially in areas that involve significant reforms. "Does any of this sound familiar? "However, there was one other characteristic that should be noted: Petty wars in the name of corporations. "Major General Smedley Butler detailed how this worked in his famous pamphlet War is a Racket. "Starting in 1898 and not ending until 1934, the U.S. engaged in dozens of Banana Wars. Repeatedly the Marines were sent to overthrow governments to our south because they had trouble paying their debts to Wall Street banks. "By no small coincidence, 1934, the year the Banana Wars ended, was the year that Glass-Steagall was passed and Wall Street was regulated. "While we have plenty of petty wars to chose from (ej. Libya, Yemen, etc. ), the benchmark for recent wars is Iraq. "It is no secret that oil companies were involved in the war planning before the invasion. There is no doubt that oil companies and mercenaries were the winners. "Before the 2003 invasion, Iraq's domestic oil industry was fully nationalized and closed to Western oil companies. A decade of war later, it is largely privatized and utterly dominated by foreign firms. For those of you who say It Can't Happen Here, it just did. 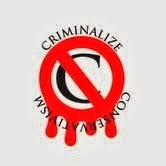 Conservatism was, is, and will always be a criminal conspiracy against the People and against democratic government. Unless Conservatism is criminalized, we will continue down the path to the Gilded Age and its promise of an Age of New American Feudalism. J.K. Rowling, Harry Potter And The Chamber of Secrets.